On April 2, mayoral contenders Lori Lightfoot and Toni Preckwinkle will square off in Chicago’s runoff election. The two emerged from a 14-candidate field in the first round of balloting on Feb. 26. 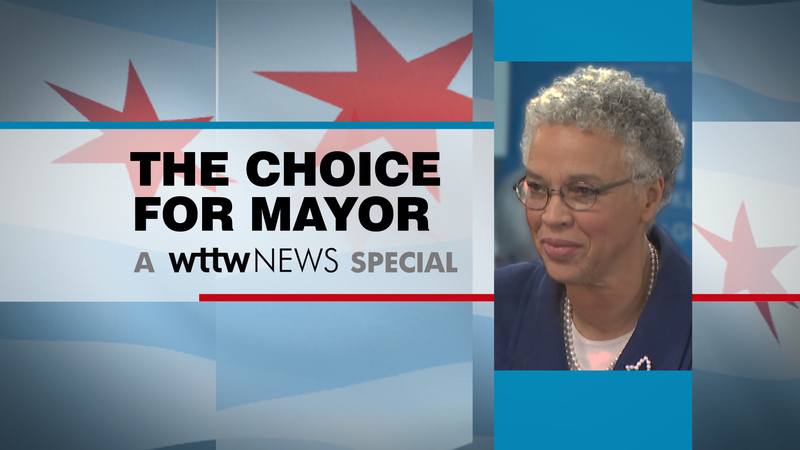 In “The Choice for Mayor,” WTTW News takes an in-depth look at the two women vying to be Chicago’s next mayor – their personalities, what shaped their worldviews, and their strikingly similar backgrounds. “(Toni) spent most of elementary school acting as a protector for the rest of the family,” said her brother Jan Reed. Preckwinkle – born Toni Lynn Reed on March 17, 1947 – grew up the eldest of four siblings in the North End neighborhood of St. Paul, Minnesota. Jan Reed said during one such attack, Preckwinkle broke free and ran home to get their mother, who spanked one of the bullies. That night, the police paid a visit to the Reed home and threatened to arrest Beatrice Reed if she ever intervened again. Mayoral candidates Lori Lightfoot, left, and Toni Preckwinkle appear on “Chicago Tonight” on March 21, 2019. She was forced to improve her study habits when she arrived at the University of Chicago in 1965. U of C is also where she met her future husband, Zeus. The couple had their son Kyle in 1981 and daughter Jennifer in 1990. Preckwinkle filed for divorce in 2013. After leaving college, Preckwinkle taught high school history for a decade, mostly at Visitation High School in Englewood and Aquinas Domincan High School in South Shore. She’s still in touch with some of her former students, who recall her mere presence in the school as meaningful. After leaving teaching, Preckwinkle went to work in nonprofits, and in 1985 she joined the Harold Washington administration’s Department of Economic Development. She challenged then-4th Ward Ald. Timothy Evans in 1983 and 1987 before finally beating him in 1991 by a mere 109 votes. “Toni was not a go-along, get-along gal. Toni worked and Toni worked hard,” said former colleague Leslie Hairston, alderman of the neighboring 5th Ward. After more than 19 years in the City Council, Preckwinkle became president of the Cook County Board in 2010. She won early accolades for rolling back a much-loathed tax hike and making strides to clean up county government. She also developed a reputation among critics as being difficult – even vindictive. But supporters say she’s used her power to take appropriate action, and to advocate for causes important to her like affordable housing and criminal justice reform. That power increased significantly in April 2018 when she became chair of the Cook County Democratic Party. If elected, Preckwinkle will be the first mayor since Richard J. Daley to lead the county party and the city simultaneously.